After establishing the need for a reusable, heavy-lift spacecraft, NASA and the Air Force began determining the design requirements of their respective services. 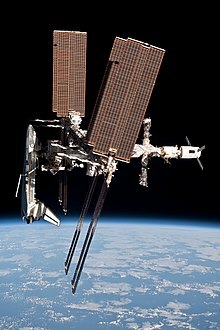 The Air Force required a 15 by 60 foot payload bay, 1,100 mile cross-range, and the capacity to lift 65,000[clarification needed] to an easterly low Earth orbit. 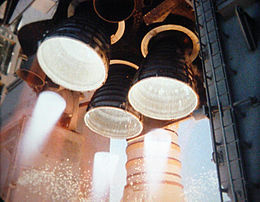 NASA evaluated the F-1 and J-2 engines from the Saturn rockets, and determined that they were insufficient for the requirements of the Space Shuttle, and issued a contract to Rocketdyne to begin development on the RS-25 engine. 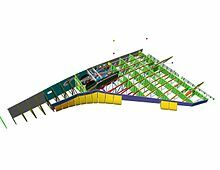 :165-168 The formal design of what became the Space Shuttle began with the "Phase A" contract design studies issued in the late 1960s. The 1998 film Armageddon portrays a combined crew of offshore oil rig workers and U.S. military staff who pilot two modified Shuttles to avert the destruction of Earth by an asteroid. Retired American test pilots visit a Russian satellite in the 2000 Clint Eastwood adventure film Space Cowboys. The 2004 Bollywood movie Swades, where a Space Shuttle is used to launch a special rainfall monitoring satellite, was filmed at Kennedy Space Center in the year after the Columbia disaster that had taken the life of Indian-American astronaut KC Chawla. 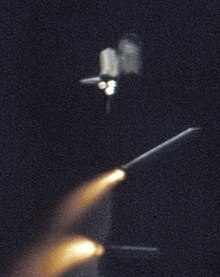 The 2013 film Gravity features the fictional Space Shuttle Explorer during STS-157, whose crew are killed or left stranded after it is destroyed by a shower of high speed orbital debris. On television, the 1996 drama The Cape portrays the lives of a group of NASA astronauts as they prepare for and fly Shuttle missions. Odyssey 5 was a short-lived sci-fi series that features the crew of a Space Shuttle as the last survivors of a disaster that destroys Earth. ^ a b CARL BIALIK (July 9, 2011). "As Shuttle Sails Through Space, Costs Are Tough to Pin Down". wsj.com. Retrieved February 18, 2015. ^ Mike Wall (July 5, 2011). 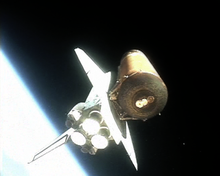 "NASA's Shuttle Program Cost $209 Billion – Was it Worth It?". Space.com. Retrieved February 18, 2015. ^ a b Woodcock, Gordon R. (1986). Space stations and platforms. Orbit Book co. ISBN 9780894640018. Retrieved April 17, 2012. 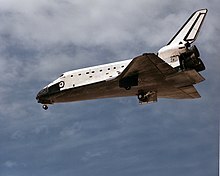 The present limit on Shuttle landing payload is 14400 kg. (32000 lb). This value applies to payloads intended for landing. ^ Bewley, Elizabeth (September 30, 2011). "SpaceX working on reusable rocket". Florida Today. Retrieved September 30, 2011. 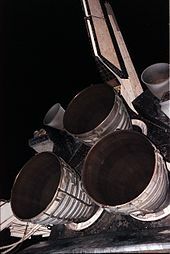 [many] rockets typically are used just once, although some partly reusable versions have been developed, such as the Space Shuttle. ^ "Solid Rocket Boosters". NASA KSC. Retrieved June 30, 2011. ^ a b c Williamson, Ray (1999). "Developing the Space Shuttle". Exploring the Unknown: Selected Documents in the History of the U.S. Civil Space Program, Volume IV: Accessing Space (PDF). Washington, D.C.: National Aeronautics and Space Administration. ^ "INTRODUCTION TO FUTURE LAUNCH VEHICLE PLANS [1963–2001] Updated 6/15/2001, by Marcus Lindroos". Pmview.com. June 15, 2001. Retrieved April 17, 2012. ^ a b c d "ESA – N° 10-1998: 25 years of Spacelab – Go for Space Station". Esa.int. Retrieved April 17, 2012. ^ "Spacelab D1 mission – 25 years ago". European Space Agency. Retrieved November 28, 2015. ^ DYE, LEE (October 28, 1985). "Europe at Helm of Tests on Next Spacelab Flight". Los Angeles Times. ISSN 0458-3035. Retrieved November 28, 2015. ^ "NASA Centers And Responsibilities". Science.ksc.nasa.gov. Retrieved April 17, 2012. ^ Guillemette, Roger (September 20, 2011). "Declassified US Spy Satellites Reveal Rare Look at Secret Cold War Space Program". Yahoo! News. Retrieved April 17, 2012. ^ "Sound Suppression Water System Test". NASA. Retrieved June 30, 2011. ^ NASA. 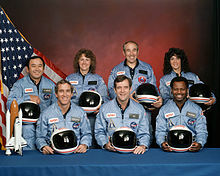 "Report of the Presidential Commission on the Space Shuttle Challenger Accident". NASA. Retrieved June 30, 2011. ^ "Jack R. Lousma Oral History". NASA Johnson Space Center Oral History Project. March 15, 2010. ^ "Gunter's Space Page – TOS-21H". Space.skyrocket.de. September 25, 1992. Retrieved April 17, 2012. ^ KSC, Steven Siceloff,. 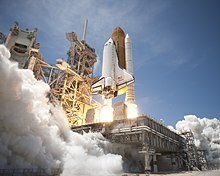 "NASA - Shuttle Computers Navigate Record of Reliability". www.nasa.gov. Retrieved February 3, 2017. ^ Peter Wainwright (spacefuture.com). 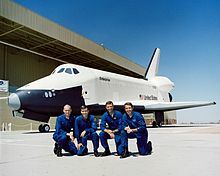 "L David, R Citron, T Rogers & C D Walker, April 25–28, 1985, "The Space Tourist", AAS 85-771 to −774. Proceedings of the Fourth Annual L5 Space Development Conference held April 25–28, 1985, in Washington, D.C". Spacefuture.com. Retrieved April 17, 2012. 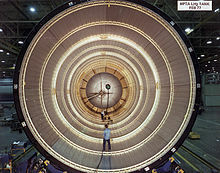 ^ "New Eyes for Shuttle Launches". Nasa.gov. November 22, 2007. Retrieved April 17, 2012. ^ Anthony R. Curtis, editor@spacetoday.org. "Space Today Online – Answers To Your Questions". Spacetoday.org. Retrieved April 17, 2012. 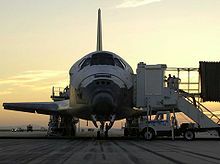 ^ "NASA – Roster of Runways Ready to Bring a Shuttle Home". Nasa.gov. Retrieved April 17, 2012. ^ Wall, Mike (September 17, 2011). 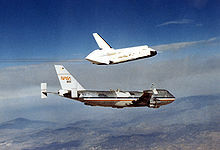 "35 Years Ago: NASA Unveils First Space Shuttle, 'Enterprise'". Yahoo! News. Retrieved April 17, 2012. ^ a b Review of NASA's Selection of Display Locations for the Space Shuttle Orbiters (PDF) (Special Report). NASA Office of Inspector General. August 25, 2011. p. 26. Retrieved October 5, 2011. ^ Broom, Jack (October 4, 2011). "Seattle still dreams of landing a shuttle". The Seattle Times. Retrieved October 5, 2011. 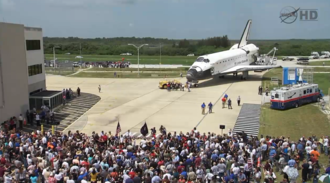 ^ Mullen, W. "No shuttle for Adler, but museum will fly with simulator". Chicago Tribune. Retrieved March 16, 2019. ^ Pearlman, Robert. "'Sooner State' shuttle: Stafford Museum to display NASA simulator in Oklahoma". CollectSpace. Retrieved March 16, 2019. ^ Gilpin, Eva. "Funds shortage has NASA simulator collecting dust". The Batallion. Texas A&M University. Retrieved March 16, 2019. ^ Winston, Hannah. "A piece of NASA history lands at Keystone Heights museum". gainsville.com. The Gainsville Sun. Retrieved March 16, 2019.